Omar Mohammed and his colleagues at the Solar & Photovoltaics Engineering Research Center (SPERC) at King Abdullah University of Science and Technology (KAUST), Saudi Arabia, study the ultrafast dynamics of photo-induced charge transfer and separation in a range of polymer–fullerene blends and harness this insight to develop a better approach to designing high-efficiency solar cells. A common way to fabricate organic solar cells is to combine two different materials, known as a polymer–fullerene blend. Light absorbed in such a material induces charge transfer from the polymer "donor" to a fullerene "acceptor," a type of spherical molecule. This creates a positive charge on the donor component and a negative charge on acceptor components. The key consideration in solar cell optimization, therefore, is to effectively separate these two charges and thereby generate an electrical current. Mohammed and his co-workers studied these crucial charge transfer and charge separation processes using transient absorption spectroscopy with broadband capability. This is a technique that measures the changes of a material's properties in response to short pulses of laser light, and in this way is able to monitor in real time electron dynamics on femtosecond (10-15 seconds) timescales. "The main idea is to provide essential information on the mechanistic and kinetic details of the fundamental events that occur at device interfaces in polymer-fullerene systems," Mohammed said. The researchers used a donor polymer called PTB7-Th and blended it with one of three different acceptors; PC71BM, PC61BM or IC60BA. 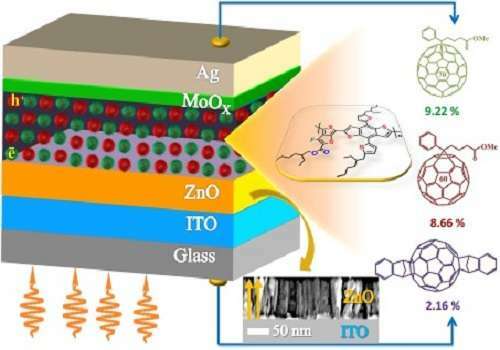 They showed that the charge transfer process occurs in times shorter than one picosecond (10-12 seconds), and that the charge dynamics and solar-cell device performance are strongly dependent on the choice of acceptor. For example, a solar cell made with IC60BA exhibited a power conversion efficiency of only two percent, but the value was found to be over nine percent in a PC71BM-based device. "This time-resolved technique is a unique pathway to study fundamental events that occur at device interfaces – saving time and effort in device optimization," Mohammed noted. "We next hope to extend this experiment to different polymers or even for solar cells based on inorganic photoactive materials."